I am a huge advocate for investing in authentic interactions with your students that are individualized to their personal traits and characteristics. Even as an adult, do you find that you work harder for those who are personally vested in your success? I know I sure do. Even as I enter Professional Development, I find that I learn best from presenters who I feel are truly vested and are there for "the right reasons" (Sorry, I couldn't resist. Any Bachelor/Bachelorette fans out there?). Their authenticity in imparting their knowledge to grow me as a therapist energizes me (and yes, they have the evidence to back their practice). The same goes for our own students/clients/kids. Taking time to invest in my students is always time well spent. Does it break my heart to learn of some of the trials or experiences that they have encountered? Absolutely. The path may be far from easy at times; however, the payout is likely what brought us into this field in the first place...to make a difference. Learning about who my student is as a whole person makes me a more effective speech-language pathologist. It often helps me determine possible functions of behavior and earns that buy in from students by making real world connections. One of my favorite activities to do with my students each year is to create "I Am" poems. Google it and you will come up with a plethora of templates. Through the years, I have adapted the questions that I ask and enter the student answers during our session in a template that I made using Word. This is one of my all time favorite activities of the year! When I have a group, I simply open up the template in numerous windows, saving it as the student's name. I can then toggle between the student documents as they take turn answering the questions. 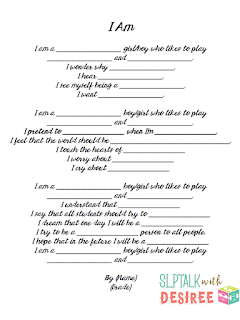 The template is also printable which is convenient later in the year when the students may use them in an interview format to interview a peer for responses. Wow, that sure does cover an array of communication skills, does it not? Let's see... articulation in context, descriptive language, answering questions, asking questions, expressive vocabulary, identifying emotions, code switching, syntax, categorization, fluency, the list could go on for days. For some of our students with a severe phonological impairment or apraxia, we may be some of the only people that understand what they are saying, aside from their caregiver. Imagine how wonderful it feels for them for someone to get to know the inner core of who they are as well as how much their teacher will appreciate the insight when they read the poem. It is life changing for some students, truly it is. This is the template that I use. Once the poem is completed, I take a close up photo of the student using my iPad, then email it to myself to insert into the word document. (Note: Photos that are taken on a white or neutral background work best). To insert the photo, you can either copy and paste it from your email or insert it my selecting Insert, then Photo, then the Saved Photo File that you Created. You can resize your photo by dragging the corners of the photo. Next, Right Click on the photo and select the Picture tab. Under the Picture tab, select Washout under the Color option. I then adjust the Brightness to 65% and Contrast to 35% but that is not necessary if you would like your picture to be very light in the background. Next, select the Layout tab (from the same menu option when you right clicked on the photo). Under Layout, select Behind Text as your wrapping style and Center under the alignment and click Okay. Your student's photo should now appear lightly behind the text of their poem. You can adjust the size as you would like. I like the student photo to fill the page. Now, all you have to do is print the poem! The poems create a beautiful display. They are make a nice gift or resource to give to parents at the student's IEP meeting. Parents often love them so much that they request extra copies. No problem! Simply save the Word document that you created when the student completed the poem as a pdf and email it to the parents! Voila! Do you have a favorite activity that helps you get to know your students better? I would love to hear about it, after all we are better when we work together, right? Drop it in the comments below!